While much of New York had been in a state of near apoplectic delirium as it anticipated the opening of Mexico City master-chef Enrique Olvera’s newest dining sensation Cosme, I have to confess that I also smooshed my nose against the glass on more than one occasion as I’d walk past the former sleazy strip bar (or “gentlemens club”) to witness the progress. Thankfully the space bears absolutely no resemblance to its former existence. 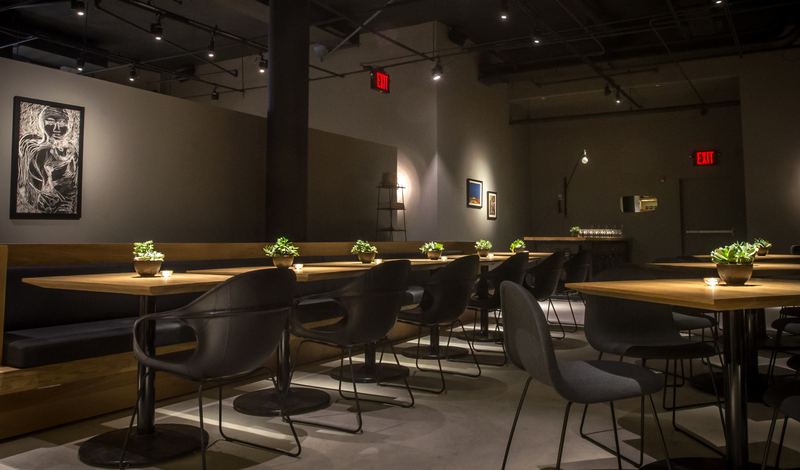 Instead Olvera’s team has created a sleek and moody, dark gray, L-shaped room with sparse lighting, bright wooden surfaces and eye-level racks of wine. In the off chance that there might still be an open ear for improvements, I would make a plea for some desperately needed sound-absorptive materials. Hidden fabric ceiling panels, cushions, rugs…anything to facilitate hearing some of the intricate preparation details from the authentically accented wait staff. I think it’s imperative to point out that if you’re expecting a typical taco/burrito/quesadilla dinner, you wouldn’t be reading a review by me. Chef Olvera’s menu is the culmination of homegrown authenticity combined with unexpected and unusual international preparations that elevate Mexican cuisine into the culinary stratosphere. The flavoring is bold – but not blunt. The dishes are diverse – but not random. The presentation is full of bright contrasts, but still very appetizing and approachable. 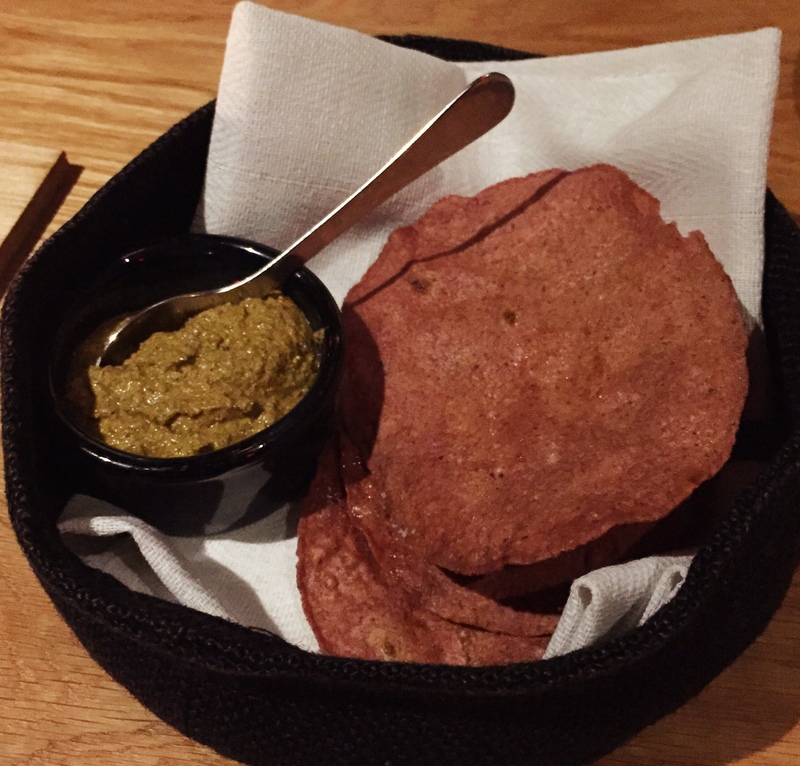 Instead of bread and butter, they serve a heavenly (yet modest) portion (I was obliged with three subsequent follow-ups) of Occidental Heirloom blue corn Tortillas, that have been dried and freshly fried until they deliver a deeply earthy and dark purple crunch with a curry colored paste of pumpkin seed, garlic, habanero peppers and butter – the perfect introduction to the dozen or so appetizers ranging from sea urchins to eggplants. 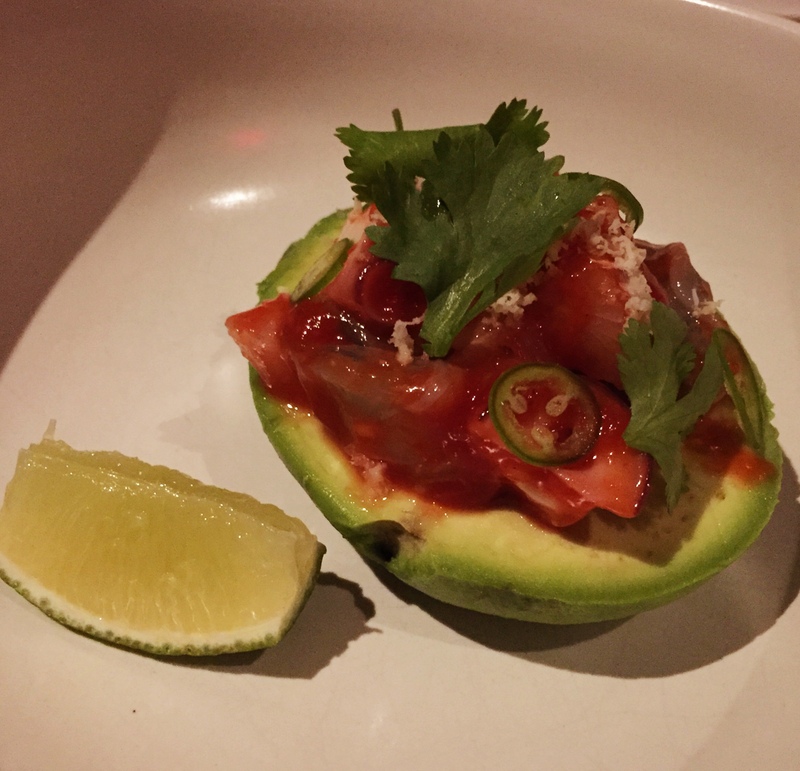 I am a huge fan of ceviche, but no one ever served me a Seafood vuelve a la vida (comes back to life) inside an avocado before. The combination of sweet tomato and horseradish, with morsels of fish inside the cocoon of a creamy avocado is utterly simple, remarkable and wonderful. We had to try the much bleated about Burrata with salsa verde and “weeds”, which is another confident combination of simple flavors and fresh textures that might crisscross multiple borders, but delivers flawlessly nonetheless. The only disappointments to the daily printed menu were the Chicharones which were quizzically sold out by 7:00pm, and our first two wine choices were both temporarily un-locatable, but the main courses proved to be fierce distractions. It was a fairly close call for the Broiled Red Snapper with a Hoja Santa salsa and plantains, but I ended up settling on the magnificent Black garlic rubbed New York strip steak. Hiding between the rare seared domino sized medallions of tender steak was one of the rare appearances of guacamole in the entire establishment. I had no idea that the über-popular green dip was such a red-headed stepchild, that it needed to be disguised as “avocado purée”! Velvety smooth and finished with tarragon and spiked with wasabi, who cares what they called it – to me it was absolutely delicious. 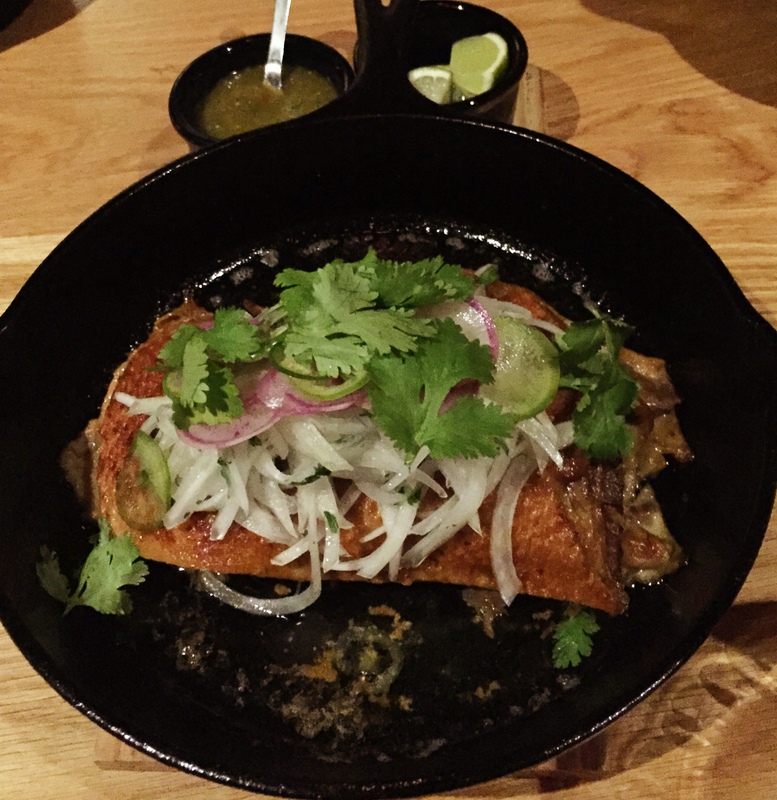 The most popular dish has to be the Duck Carnitas – and with good reason. The boneless breast of succulent, salty duck literally tears apart with little more than a suggestion, before being inserted snugly into warm, fresh tortillas along with white onions and a citrusy salsa verde. They describe it as a sharable dish, but that depends on the familiarity of your fellow diners. 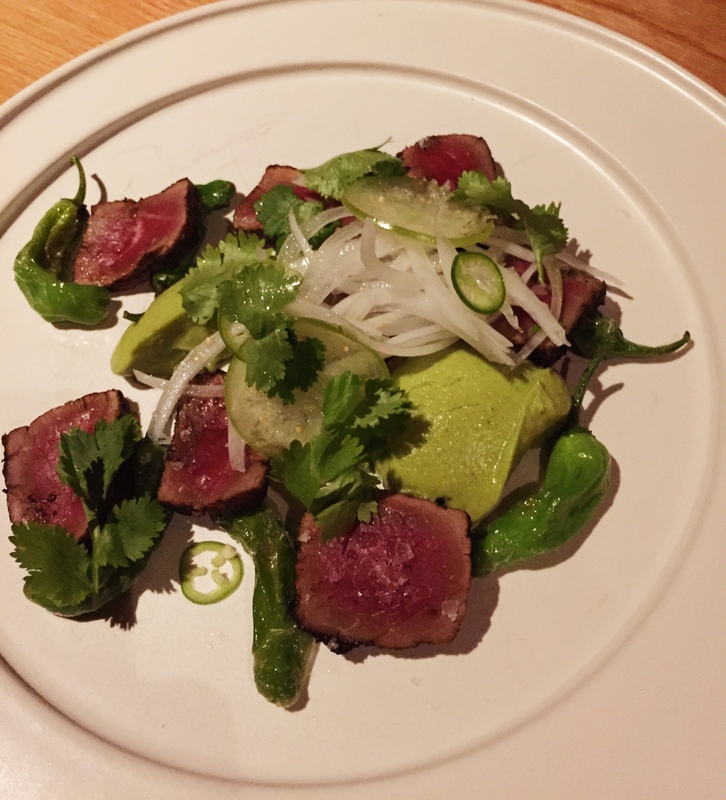 Olvera’s contra-ordinary prowess shifts ceaselessly into the desserts. His two fluffy Husk Meringue halves are actually made from dried, ground corn-husks, which are separated by a surprisingly light and airy mound of corn and mascarpone mousse (although a dose of liquid nitrogen can even make me light and airy) but the dominant sweet and subtle savory combination is the work of a flavor maestro who knows what he’s doing. 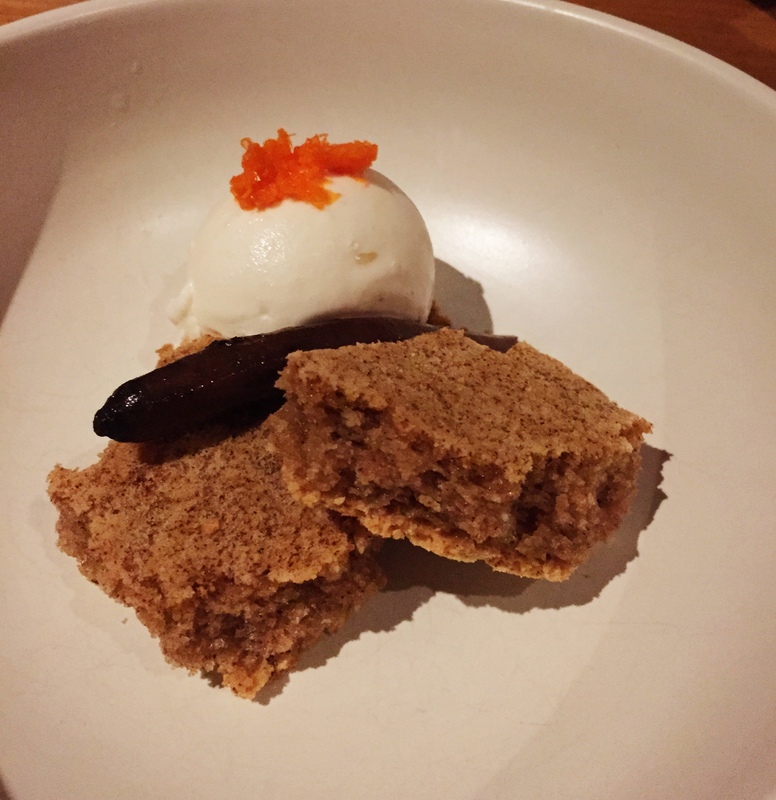 Also taste-worthy is the unpronounceable yet utterly caramelicious Nixtamalized Carrot paired with a cinnamon cake and sweet-tart cream-cheese ice cream. 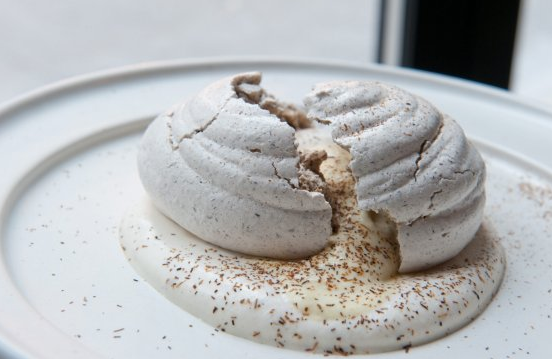 Even though Enrique Olvera named Cosme after his favorite obsession – the cosmos, in my mind the man wasn’t just reaching for the stars – he seems to have clutched a few fistfuls before bringing them down to the Flatiron district to share with the rest of us.